Thank you SO MUCH to everyone who entered my nail art contest!!!! There were so many entries and now I see why I prefer to let you guys vote… because picking between the wonderful art and the wonderful stories BEHIND it is heartbreaking! I want to pick you all as winners, but I only have one set to give away, so the winner is……. Amber is celebrating the arrival of summer to Northern California so that she can spoil her dog (Missy AKA Baby Cakes) with long walks and playing in the park again. Her favorite Nicole By OPI Polish is I’m A Belieber with You’re S-teal The One as a close second. Congratulations Amber!!! I’ve contacted Amber for her details so that I can get her prize to her ASAP! Just as a note too, I don’t have any prizes for second place but I felt that a shout-out was certainly in order for Julia with her Summer Vacation Manicure! She is in the sixth grade and is new to nail art, but her design was great and Julia, I really hope you keep up the great work with nail art because you have some talent, girl!! Her mom is AMAZING at supporting her, by being her hand model and letting her finish her design before bed and so I want to say THANKS to Julia’s mom, too! Thanks again for participating- ALL of the designs were awesome! Also as a heads up, I’m in the process of moving my blog to my own domain and doing some technical stuff, so if it seems that it’s not working- that’s why. I’m still here- I haven’t left ya, but there is a lot of stuff to work out to get it all working. 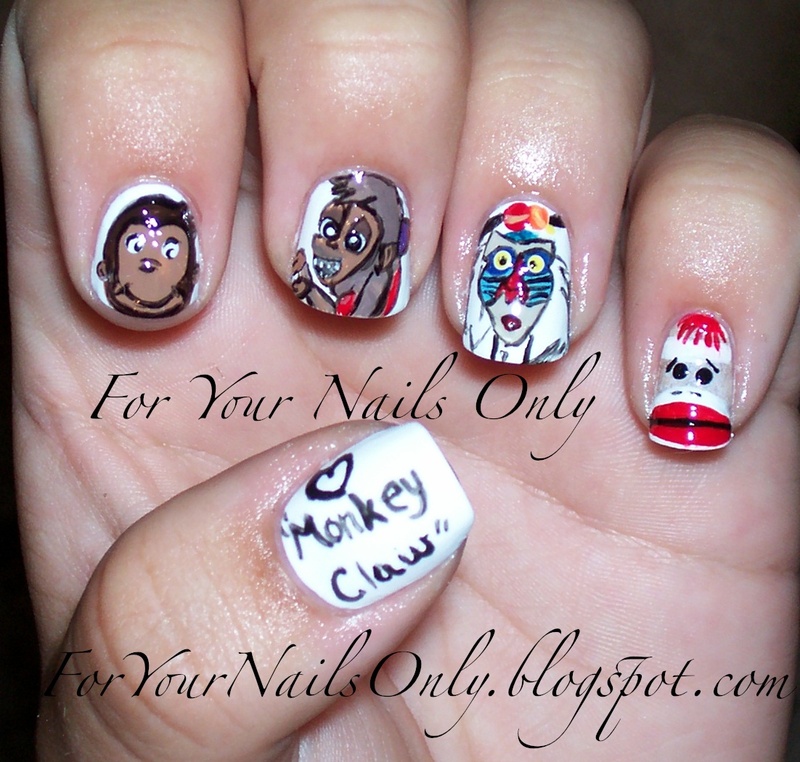 My NEW blog url is “ForYourNailsOnly.net” but you can still use the blogspot one and it will redirect you. Happy Birthday to you, happy birthday to you, you LOOK like a monkey, and ya SMELL like one too!!! That is the song that I woke up singing. Yes indeed, it is my birthday today! 22 whopping years have passed. I decided that since that version of happy birthday has me looking like a monkey, it was time to do the design that I promised I’d do on facebook a few weeks ago. When my Nicole By OPI Blogger Spotlight first came out, a person on facebook said that the position of my hand looked like a monkey claw and that I should find a different one. Since I don’t really get affected by random strangers’ insults, some fellow readers and I decided that it was actually pretty funny and that it’d make a good design- a way to overcome the insult and turn it into something good…. Well now is the time, my friends…. its… THE CLAWWWWWWW!!!!! (and if you’re wondering what that reference is… dear Red Stewart and Cathy Richardson nicknamed me MC for Monkey Claw based on The Claw from Liar Liar AND if you’re wondering what the title of this post is about, its a funny quote from the movie Beauty Shop and it fit right in today). I used a mix of OPI and Nicole By OPI for this design because I didn’t have enough of just one or the other to do all of it in one brand. I started with OPI Natural Nail Base Coat, OPI Alpine Snow, OPI Ya’ll Come Back Ya Hear?, OPI Ski Teal We Drop, Nicole By OPI Razzle Dazzler, OPI Suzi Loves Cowboys, Nicole By OPI I’m A Belieber, OPI Fiercely Fiona, Nicole By OPI Red-y To Runaway Love?, OPI San Tan-tonio, Nicole By OPI “Baby” Blue, OPI Dating A Royal, and OPI Skull and Glossbones. Topped everything with a coat of Seche Vite. The products in this post were sent to me by the manufacturer. For further information, please read my disclosure statement. Thanks to the Nicole By OPI blogger spotlight, they have graciously decided that I get to give one of you lucky readers in the UNITED STATES** a FULL set of the collection Something About Spring!! 1) You must be a follower of this blog to enter. New followers are welcome. 2) ** YOU MUST BE IN THE UNITED STATES. The reason for this is because Nicole By OPI will be shipping directly to you and as a large company, there are laws regarding shipping polishes internationally. So, to win this contest, you MUST have an address in the US. Sorry international folks! 3) Create a design that is FREEHAND ONLY. No stamping, You MAY use apliques, like rhinestones, pearls, and beads but you may not use stickers, stamps, or decals. 4) You must create the nail art on real hands, not mannequin hands or faux nails (acrylics, gels, etc on sticks, model hands, or loose). 5) Tell me your favorite Nicole By OPI Polish. It can be any of them but if you don’t know where to start, try the Try It On Studio. 6) I will be accepting entries until 11:59pm EDT on June 30th. 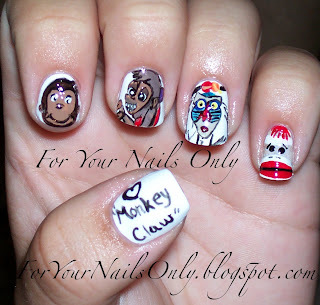 The theme of the nail art? Life for me has been filled with LOTS of celebrations of good things lately- birthdays, graduations, new beginnings etc and so I’d like to see you create a design that shows your happy celebratory side!!! In addition to your design, write a short blurb on your design and anything good going on in your life lately, even if it’s the smallest thing in the world. We all have reasons to be happy but sometimes we get wrapped up in stress and forget. I want you to realize that you have things to be happy about and to celebrate! So in short, send me an email with your follower name, do a celebration nail art design by hand, explain your reasons for celebrating even if its small, pick a Nicole By OPI Polish that is your favorite, and then email me your entry at tfardellone@gmail.com before June 30th at 11:59pm EDT. The winner will be picked by me based on your overall story and design and I will put the winners nail art on my blog in the winner’s announcement post! No, this isn’t a nail art design (look later for that!) but quick story: when I was starting college, I bought a bunch of posters. Sadly, only one or two remains- either from continually hanging them in my new place every year or my cat Angel ripping them while I was asleep (GRRRR). One of my favorites recently passed away due to Angel-ripping… a poster by Dominique Appia called Between the Gaps of Memory. I just ordered a replacement for ($1, $5 including shipping!!) our new apartment. I decided to do a bit of research and I just want to share his website with you because its SO unconventional and, beautiful. 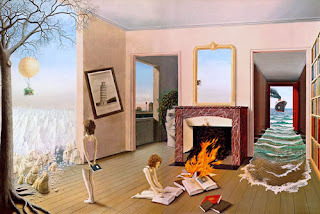 Click on the rooms to see his artwork. My favorite is the one on the left with the girl and the burning books, but I’m looking around and already falling in love with several of his other pieces. Click on the image to get to his website… Enjoy!! !